California Closets of WNY is pleased to announce the winners of the 2018 California Closets Scholarship at Villa Maria College of Buffalo, NY. The scholarships were awarded to two students who participated in a design competition held during the Fall 2018 semester. An independent panel of seven judges from the WNY design community selected the winning projects from a field of twelve. Students were challenged to use the principles and design elements associated with the California Closet system of products to design a storage space within their Forever Home that complied with the award guidelines. The competition was open to students in the two-year Associate Degree and four-year Bachelor Degree programs. Mindy Robbins, a Villa Maria student working towards her Associates in Applied Science Degree in Interior Design, was awarded a $500 scholarship for her Main Bedroom project. 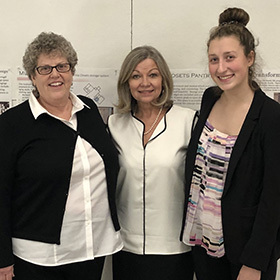 Megan Marafino, a Villa Maria student working towards her Bachelor of Fine Arts Degree in Interior Design, was awarded a $2000 scholarship for her Mudroom/Laundry project. Both students will be applying their scholarship awards towards their spring tuition. California Closets would like to extend a special thank you to Sandra Reicis, Professor of Interior Design at Villa Maria. Sandra was instrumental in establishing the scholarship and coordinating the competition. Robert Reeder, Principal, Robert Reeder Interiors Inc.